The first part is extracted from the SQMP Preface; after this it says, "In 2002 (Bai) Yunli made this for Mr. (Tang) Shizhang"
The painting shows Xi Kang playing the qin and Ruan Xian carrying his ruan; Ruan Ji is probably the one in front. 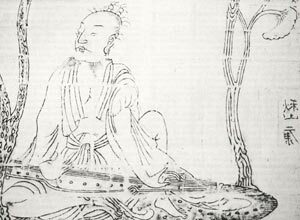 In the seal 健 Jian looks like 侓 Lu. Liu Jian, a well-known painter, was at the time 中國美術學院教授、副院長 a professor and vice principal at the China Academy of Art in Hangzhou. 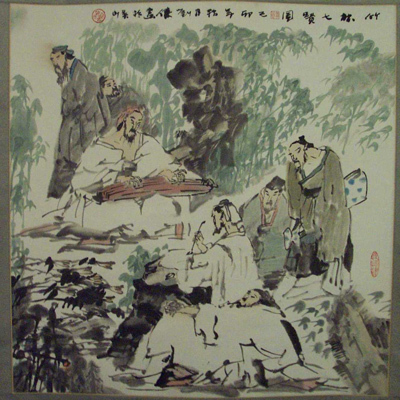 However, a closer examination of this reversed image raises interesting questions about to what extent these images can show how the qin might then have been played by someone seated on the ground. Did the artist really have an accurate understanding of this. As this closeup of the hands shows, it seems that Xi Kang is playing by extending his hands all the way across the qin then twisting his wrists so that he seems to be playing with some of his fingers facing him; this would be extremely awkward and unnatural. 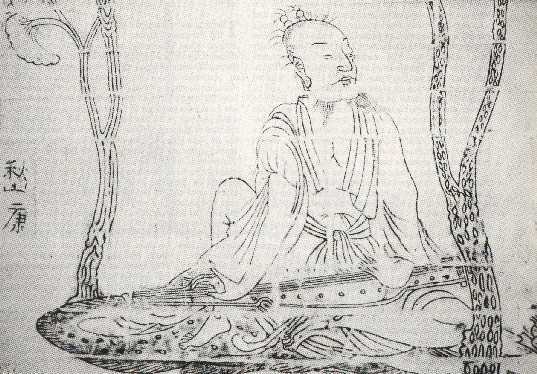 The upper end of the qin is clearly resting on Xi Kang's right thigh, but the lower end seems to be suspended in air. 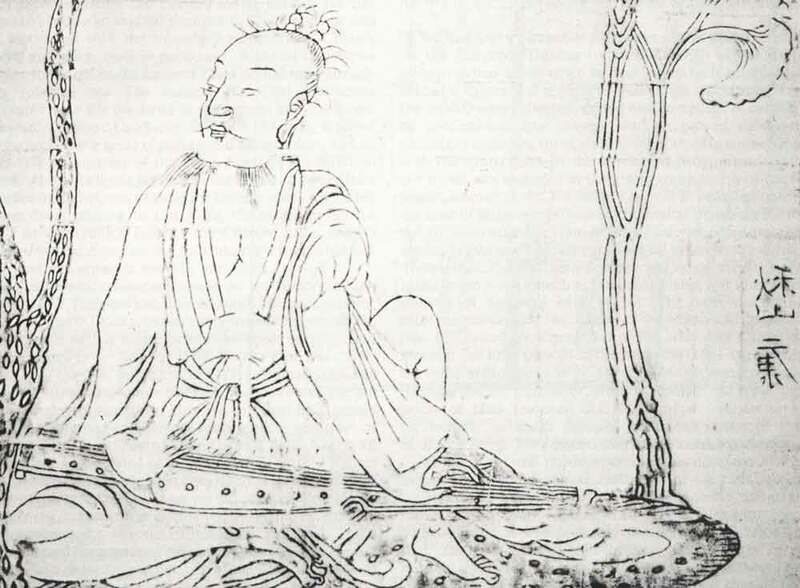 Although it is possible that it was resting on an object that is covered by part of Xi Kang's robe, it seems more likely that this part of the illustration also incorrect. Personally, I can quite comfortably sit on a flat surface with the right knee bent on the ground, as shown, and with the left knee raised somewhat, also as shown; but then I play while resting the lower end of the qin on something like a book. In addition, from the depicted position I can keep my heel on the ground pretty much where it is shown here, then lift my toes so that they support the qin. Playing the qin in this manner allows the sound to resonate nicely off the floor under the qin. Although my left foot becomes tired rather quickly, with practice presumably this position could be maintained for extended periods. It can be seen that the left hand is somewhat constricted by the left knee, but this position can easily be adjusted so that the knee is not in the way.